How to remove text & character formatting from email text? Email can have lot of character formatting, specially forwarded emails contain loads of “>” characters. Manually editing and removing such characters takes lot of time and effort. 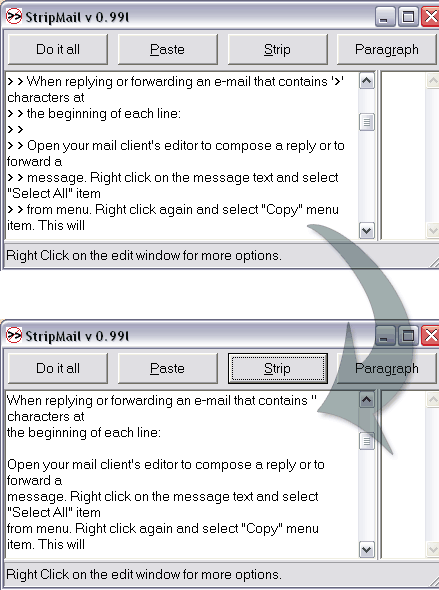 How about doing it with a click of button using StripMail? It is a free application that can free up email text from ugly character formatting. It does not require installation, just download and double click to start using the application. Open your email inbox and then select all the text using mouse or press Ctrl + A to copy the text and then open StripMail application. Click Paste button at top menu in StripMail to see copied text in the application. Click on Strip button to remove all the character formatting. You can arrange multiple lines in one paragraph by clicking paragraph button. Also, you can click do it all button to perform strip, paragraph and other operations in one go. After formatting removal click copy button and then open your email inbox. Press Ctrl + V or right click then click on paste option to paste text without character formatting. Download StripMail to strip off ugly characters from email text in few simple clicks! Voice & Video Chat in Gmail, Get it Now !